“The low-down sneaking thief!” Jack Ramsey’s wrath hissed on his lips as he flung the steel traps to the ground. Of thirty, all but two had been stolen. Wrinkles of perplexity seamed his face as he sprawled on a great rock in the wilderness, munched his lunch and stared at a distant hilltop. Jack Ramsey’s blue-gray eyes did not lack shrewdness. With his tawny hair, long face and lean jaw, they were combined in a type of youth not easily deceived. He concluded that the thief had followed him the night before through brush, fern and swamp and taken each trap as soon as he had moved on to the next one. The thought brought Jack upstanding. Tossing the crumbs of his lunch to a scolding squirrel, he set off at a brisk pace northward. The confidence of his advance proved that no part of this strange place was unfamiliar to him. Yet few domains of equal size set up so many barriers against a close acquaintance. In some distant age a great glacier, crushing and combing the mountains to the north as it advanced, had here found a conqueror in hot sunshine. As the ice field melted, vast masses of granite boulders, pebbles and gravel buried in the frozen depths were cast into hummocks resembling little mountains, or piled in driftways or stacks like playing cards or ears of corn, in indescribable confusion. Thus was formed this utterly barren, haphazard place some five miles square, now honeycombed with swamps or covered, where the rocks permitted, by bush or forest. Around this land passed modern highways. Aeroplanes soared overhead. Toward it, thriving New Jersey towns were crowding close. Thirty-five miles away, as the crow flies, stood the City Hall of New York, the world’s greatest metropolis. Yet the hardships that must be faced while penetrating this natural fortress caused it to remain almost unknown and shunned by men. Jack Ramsey recalled having seen, while hunting in previous years, a deserted cabin built by lumbermen on a rocky knoll near the northern end of the wilderness. Here might live the tramps who were helping themselves to his traps. He would call them to time. His visit to the cabin was one of surprises. From the crooked chimney curled smoke that intrigued his nostrils with odors of sassafras and newly made coffee. Crumbling woodwork had been replaced and the windows reglazed and hung with curtains of snowy whiteness. Flowers were blooming in a border along a wall. The door was opened by an upstanding, buxom girl, sweet and wholesome as the sunshine that had tanned her cheeks and bare forearms. At sight of him, her eyes brightened. The man addressed was sitting in a corner shaping a billet of wood with a hunting knife. When he raised his pale, bearded face Ramsey recognized Jimmie Willets, a half-wit whom he had met in the wilderness. 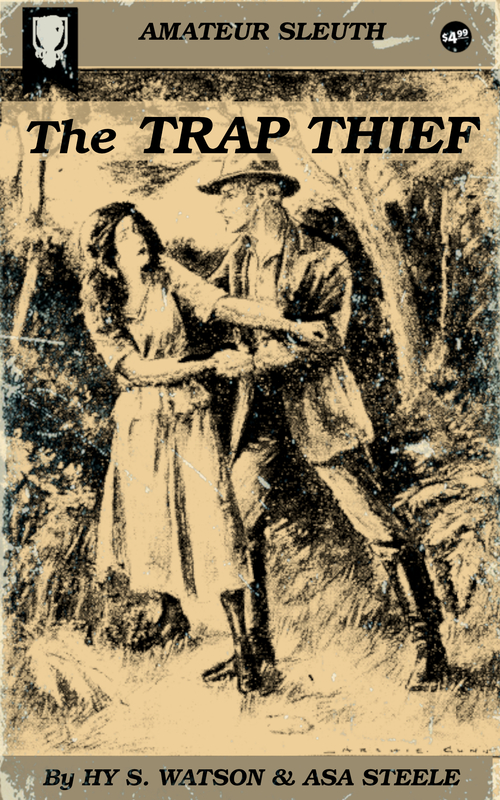 “I’m Jack Ramsey, from Honesdale.” While Jimmie Willets brought the water and Jack drank of the cool, sweet draft, the young trapper fell into chat with the girl like an old friend. Jack sensed a warm and gracious womanhood and the invitation of one hungry for companionship, while the girl, with that instinctive wisdom as old as womankind, whetted his interest by urging him to talk about himself. “My! With all those fine thoughts you should have a more romantic name,” she teased, an appraising common sense behind her laughter. “It makes me think of Buffalo Bill and Leatherstocking, and savage men hunting wild beasts—I have it! Hereafter, I’ll call you ‘Lean Jaw’!” He felt the sting of her raillery as he laughed with her. Yet he would not have had it otherwise, longed for it again. Was she interested in hunting? Jack thought she might explore the wilderness with him and see his traps. “Then you’re the man whose traps were stolen?” she asked quickly, as if the words had escaped her unawares. She went to a dresser and took from it five new steel traps, which she flung on a table at Ramsey’s elbow. “I found them on the road to Honesdale,” she replied. Swiftly a veil of mistrust had been drawn between them. He was seeking an answer to his doubts with a look as bold as hers had been a moment since. She turned away, a crimson glow mounting to her temples. In the lengthening silence, Jack had no alternative but to thank the girl and go. The story continues … learn the Mary Gage’s secret!